I feel a profound sense of this every time I play on warm slick rock with my family and laugh until my body can’t take any more. However, this sentiment never devalues my experiences adventuring solo and, as an introvert, I find special moments by myself invigorating. I don’t always want to be out alone but happiness definitely also exists when I am all by myself. Many posts I have read and even written recommend always heading out on the water with a paddling buddy. Safety in numbers is always a smart rule to follow whether on land or water and the latter can be utterly unpredictable at times. However, many weekends I find myself without a paddling partner. I’m fairly easy going, so I often defer to other people’s preferences. All by myself I get to choose exactly where and when I paddle, how long and for some reason I usually pack a little extra chocolate. Solo adventures feel like a secret. At the end of October, I was itching for an escape into the mountains. There had been some light snowfall but we were still a few weeks away from the start of a relentless winter. I had planned to head to a reservoir with a new friend from work and his wife but I woke up to a text that they had to bail after spending the majority of the night assisting a climbing rescue. I could have easily talked myself back into bed with plans for late morning brunch with friends, but I filled up my thermos with black coffee and drove up to the reservoir. I walked down the pebble beach and propped open my camping lounge chair and nestled into my puffy blanket. Wind ripped through the area and created waves I felt uncomfortable tackling while out on my own. I texted a friend my plan before I lost cell service and drove up the winding road into the Uinta mountains. Mirror Lake Highway leads to an impressive network of lakes, most of which are a few miles hike off of the road. Although I have hiked my board solo into some of these lakes, I decided to exercise a little more caution due to the late fall conditions and the fact that I was only a couple months into my recovery from ankle surgery. Mirror Lake is the most accessible lake off the highway and is accordingly the most popular spot with a large campground and a path circumnavigating the small lake. Carrying my pack down to the edge of the lake I found a few anglers patiently casting and several families stretching their legs after a scenic drive. 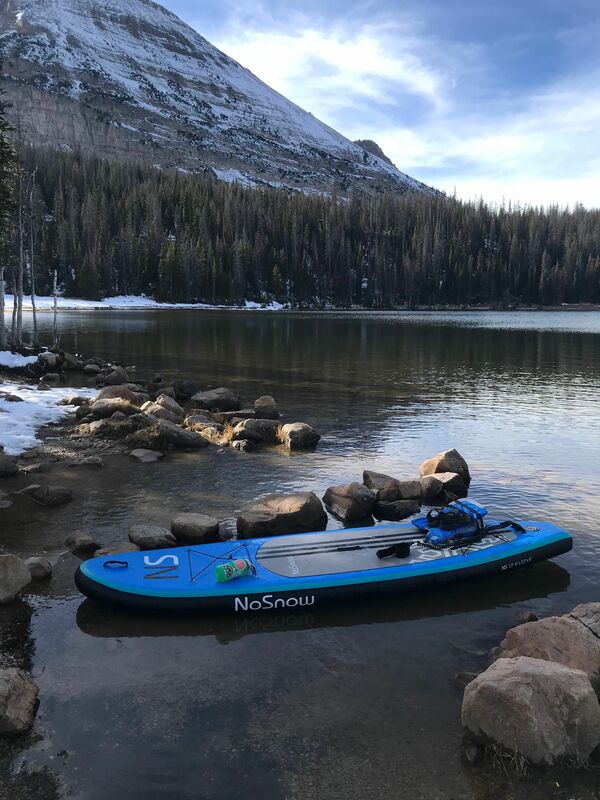 Usually, I inflate my inflatable SUP without an audience or fanfare but several people approached to question me, most likely emboldened by the patches of snow lining the lake. I regularly find that someone who says “wow you are so brave” actually means “you are an insane person who is going to end up on the news.” I don’t bother explaining to them the hours I’ve logged on this exact board, the full change of fleece clothes in my dry bag, or the thoughtful decision making that went into picking this lake today. Instead I usually respond with an incredibly clever “haha yeah” which acknowledges their concern but dismisses any need to defend myself. It’ll give them something to shake their heads about in their cars later. My feet got a little cold as I launched my board but, growing up in Idaho around lakes and rivers, it’s a sensation they are used to. On a lake usually congested by canoe traffic (the best kind of boat traffic in my opinion), I was out on the water completely by myself. In still, idyllic moments like this I love seeing trout take flies right next to my board and eagles perch on trees seemingly just an arm’s reach away. I didn’t fall in or die of hypothermia; I simply paddled around for a few hours with a giant smile on my face and then headed back home. Paddling by myself, I don’t get to share this experience with anyone else. Sure a few friends and family members get a brief highlight reel, but the exact sequence of events, smells and sounds belong solely to me. I try not to take on excessive risks when I’m by myself but I believe some risk is better than staying in bed because an adventure partner can’t join. Relying on myself and my judgment brings a certain level of excitement and pride. The beer at the end of the day tastes a little better too. Stand Up Paddleboarding (SUP) can be relaxing or thrilling— it is up to you! 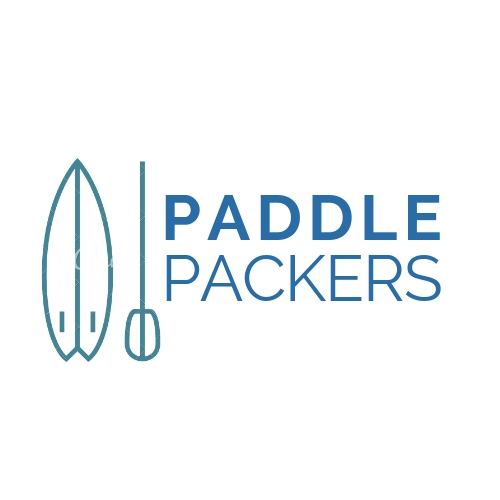 Paddle Packers is a resource for beginning tips, gear reviews and trip ideas. Debra got hooked on paddleboarding after a trip to Lake Powell with her favorite adventure buddy— her mom. Debra lives in Salt Lake City and gets her inflatable SUP in the water as often as possible. Get our FREE SUP Packing Checklists!